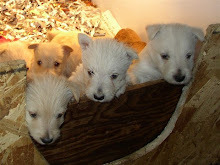 Montgomerie of Camas - AKC Scottish Terriers: Lizzy had puppies! We are now taking reservations & deposits. Health Guarantee & CONTRACT on our website. News from Fingal: now living in England!